Farm House at Breckenridge Brewery is the Colorado destination spot for handcrafted food and beer. Enjoy a meal in the rustic dining room or on the cozy back porch overlooking the Rocky Mountains and our expansive outdoor beer garden, where leashed and well-behaved dogs are welcome. 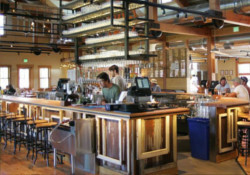 Taste Breckenridge Brewery’s variety of beer styles at the bar in the heart of the restaurant, and sign up to tour the brewery next door.